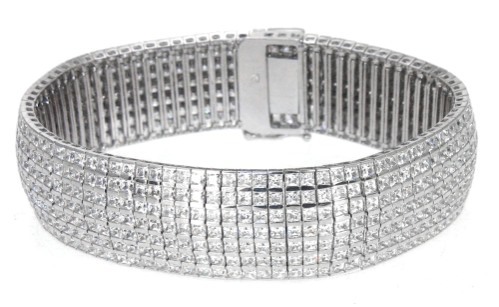 The Vendome Flexible Princess Cut Square Channel Set Cubic Zirconia Bracelet adds the finishing touch to your ensemble for that special occasion. A smooth and flexible feel is achieved by the placement of about 30 carats of princess cut squares in a channel setting. Our Russian formula cubic zirconia is hand cut and hand polished to exact diamond specifications. The width is approximately 17mm. 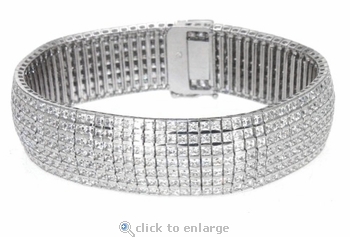 A single safety clasp secures this magnificent bracelet. This bracelet comes standard in 7 inches, and an upgrade to an 8 inch length is offered in addition to your choice of 14k white gold or 14k yellow gold. For further assistance. please contact us directly at 1-866-942-6663 or visit us via live chat and speak with a knowledgeable representative.